The three new devices range in price from €180 to €290 and run a new version of Symbian that integrates NFC more deeply, allowing pictures to be shared, devices to be paired and check-ins to be made with a single tap. Nokia has unveiled three new NFC smartphones as well as an updated version of the Symbian operating system and an NFC-enabled Bluetooth headset. The Nokia 700 measures just 110mm by 50.7mm by 9.7mm and weighs 96g. The phone includes a 1GHz processor, 3.2-inch screen, GPS, a compass and a 5-megapixel camera as well as NFC. The 700 will be available in cool grey, silver and white, coral red, peacock blue and purple versions and will retail for around €270 (US$389) before local taxes or operator subsidies. The Nokia 600 is designed as an all-in-one entertainment hub. 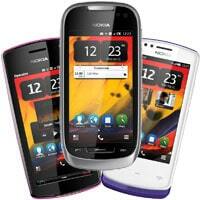 It features a 1GHz processor, a 3.2-inch screen and a 5-megapixel camera as well as NFC. The Nokia 600 will be available in black, white, pink and lime and will cost around €180 (US$260) before local taxes and operator subsidies. Nokia has also launched an NFC-enabled headset, the Nokia Essence Bluetooth Stereo Headset which NFC phone users can pair with by just tapping the phone on the controller.